Dialect Coach to the Rescue! You are at:Home»Uncategorized»Dialect Coach to the Rescue! Talking in silly accents is super fun until you actually have to pass as someone from a foreign land in an audition room in front of people who may actually know good from bad. Then daunting is more the name of the game, along with choice expletives and rising terror. Which are all kinda fun-killers and most certainly death to good acting. It was just supposed to be a silly accent! When did it become HELL ON EARTH? And then, at a certain point, I did know what I was doing. And once I got used to this crazy coaching career – once I felt like I was less faking it and more making it and the impostor syndrome subsided – I realized that I had found a pretty amazing way to mesh my unbridled affection for actors and acting with a good ear, a voracious nerdiness when it comes to text analysis, and my lifelong giddiness about how language and communication works and how it evolves. 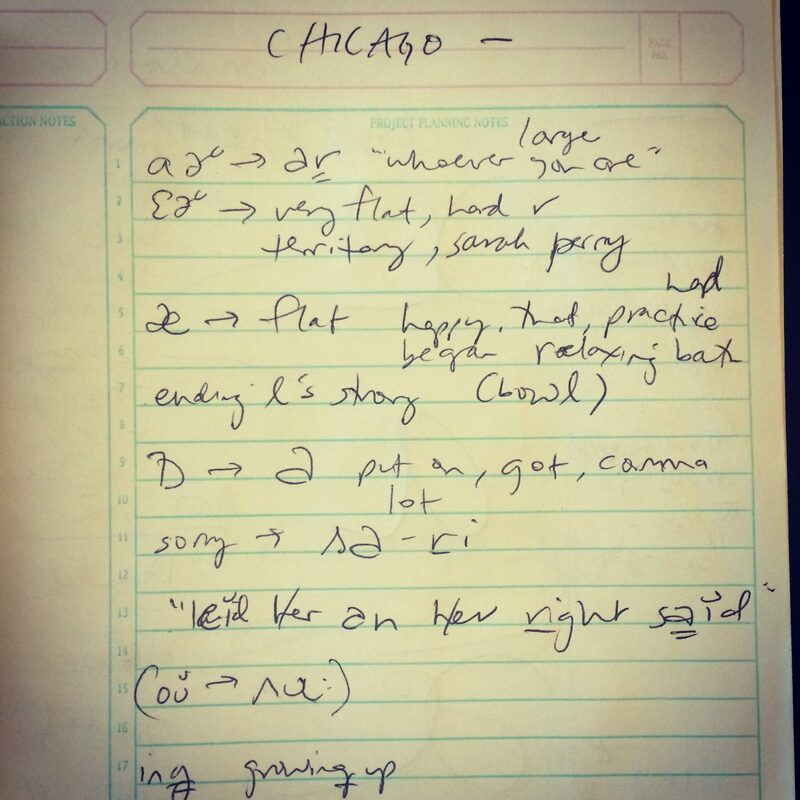 Straight from my notebook, prep while listening to someone with an authentic Chicago accent. The other half of what I do is the kooky, inexact part, a mix of psychological and sociological nerve-calming, so that the above can actually be learned and embraced and integrated and adored (yup, in that order). Because the act of picking up a new accent inevitably arouses all kinds of internal drama, whether the client is new to acting or a big, fancy TV star. And whether the drama is conscious – I don’t sound like myself anymore! I suddenly can’t trust my instincts! I’m not even thinking about the meaning of the words! HOW WILL I EVER ACT AGAIN?! – or unconscious, which manifests itself in held breath, a flushed face, contorted muscles, even the most preternaturally blasé supermodel losing her cool at my dining room table. Learning to speak with a new accent, like acting, takes courage. And it can and should be fun to be this courageous – to push through the fears and the rising panic and seize one’s inner heroism and a whole new identity – but of course it helps to have someone there to remind you of that, cheerleading, reflecting back that hero-in-the-making. I get to do that. And it’s awesome. But it’s not just awesome, ‘cuz here’s the realness (hashtag the struggle): many actors who do not come from money or who feel otherwise disenfranchised, reflect this disadvantage in their voices. From black actors who get typecast as thugs to girls who fight to be taken seriously as leading ladies because their voices peg them as ditzy and/or evoke Kim Kardashian, it’s pretty clear that how we speak plays a large role in how we’re perceived – and can dramatically affect our livelihood on stage and screen. The thing about learning accents, and learning more about how our instrument works in general, is that it offers us choices. And choices are what disenfranchised people lack. As an A student who was all about finding the wily shortcuts, I totally get the impulse to wing it, to resist learning any of the technical stuff because of that icky inorganic feeling that occurs before you get to the other side (or, let’s face it, because it requires some cash to hire a coach) but I gotta say, it’s so worth it, y’all. Because speech awareness and a bit of technique frees everyone – regardless of background or self-professed identity – to play different aspects of the human experience, with honesty. To have the tools to make choices. To play someone upper class or lower, educated or not, brilliant or… touched, old-fashioned or ubertrendy, macho/feminine or gender-fluid, humble or entitled, ironically detached or earnestly engaged. We are large, we contain multitudes, and it’s pretty satisfying to try on different versions of ourselves and admire the fit. That’s why we’re in this business, after all, and why we fight through the Hollywood crap to stay in it. So next time you get an audition for a role that requires an accent, know that the fear is totally normal, and that breaking through it will feel oh so good. Hire someone kind but honest, and unlock a new part of you. Attack those sounds with gusto, and find your way back to the silly accent fun of it all. For more, check out Samara’s dialect website http://www.LADialectCoach.com and send her a note with any questions there. Samara's all about collaborating to tell stories that are good for the world or good for a laugh or both. She edits books, copy, and scripts in Hollywood and contributes culture and tech/innovation content to various publications, including Wired: Insider and the Huffington Post. She's a frequent moderator at Silicon Beach conferences and was recently on the leadership council for the United Nations’ first ever summit on the role of media in promoting social causes. She's an Ambassador of coworking space WeWork, an Advocate for artworxLA, an Al Gore-trained Climate Reality Leader, and a member of the Alan Alda Center for Communicating Science. 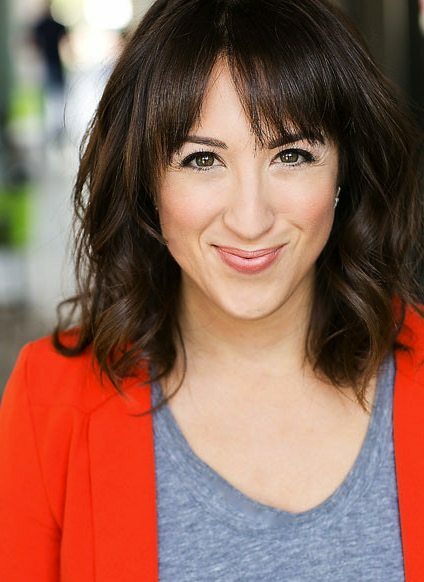 As a speech and communication gal, she dialect coaches on TV and film sets (most recently Captain America: The Winter Soldier, X-men: Days of Future Past, The Lone Ranger, pilots) and works one-on-one with professionals in the creative, science, and business arenas to improve their ability to convey their message and connect. Follow her on Twitter and IG @samarabay and check out her website, www.samara-bay.com, for more.